A total of 40 records matched your search. 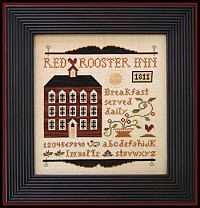 Ornament of the Month 2011-Cardinal Winter from Little House Needleworks is stitched on 30ct Cocal Linen from Weeks Dye Works or a fabric of your choice with a stitch count of 57w x 57h using 2 Crescent Colours and DMC floss. 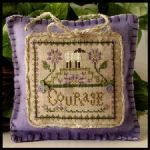 DMC alternatives are available for the hand-dyed floss. 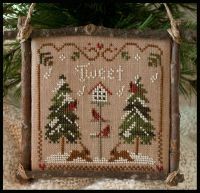 Six Little Cardinals the 6th of the 2012 monthly ornaments from Little House Needleworks is stitched on 30 count Cocoa from Weeks Dye Works or a fabric of your choice with a stitch count of 45w x 63h using DMC floss. 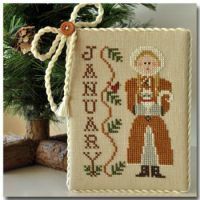 All Is Calm is the 11th ornament of the month from Little House Needleworks stitched on 30 count Natural Northern Cross and a 14 count comparable fabric may be used with a stitch count of 70w x 44h using DMC or Anchor floss. A bonus ornament is included in the package. 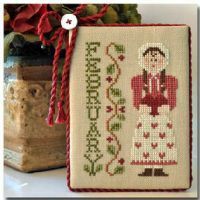 Calendar Girl Series-February from Little House Needleworks is stitched on 14/28 count Clay with a stitch count of 46w x 67h using DMC. 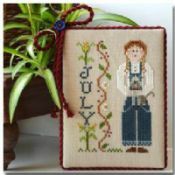 Collect all 12 Calendar Girls and stitch together. 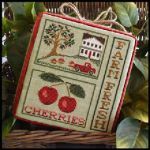 Farm Fresh Cherries from Little House Needleworks is stitched on 16/32 count Summer Khaki with a stitch count of 85w x 97h using DMC floss. 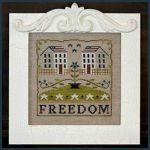 Freedom House from Little House Needleworks is stitched on 30 count Natural Linen from Northern Cross or fabric of your choice with a stitch count of 89w x 89h using 2 Weeks Dye Works and 4 Classic Colorworks hand-dyed fibers with some DMC alternatives provided. 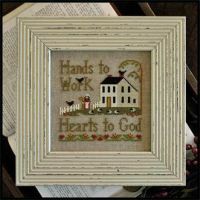 Hands to Work from Little House Needleworks is stitched on 30count Natural Linen or fabric of your choice with a stitch count of 77w x 77h using DMC floss. 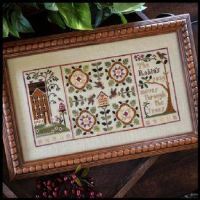 Hometown Holiday Series-Town Church from Little House Needleworks is stitched on 30count Natural Northern Cross Linen or a fabric of your choice with a stitch count of 81w x 58h using 2 colors of Classic Colorworks and DMC floss. 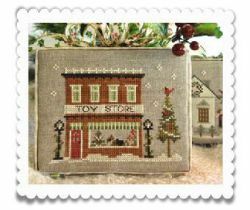 Hometown Holiday Series-Toy Store from Little House Needleworks is stitched on 30count Natural Northern Cross Linen or a fabric of your choice with a stitch count of 70w x 53h using 3 colors of Classic Colorworks (formerly Crescent Colours) and DMC floss. 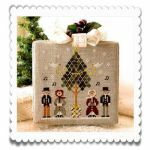 Caroling Quartet, the third in the Hometown Holiday Series from Little House Needleworks is stitched on 30 count Natural Northern Cross Linen or a fabric of your choice with a stitch count of 63w x 67h and uses 2 Crescent Colours with DMC alternatives provided. 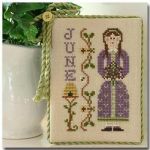 A gold metallic thread is also used. 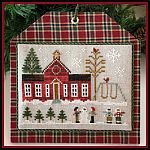 Hometown Holiday Series-Main Street Station from Little House Needleworks is stitched on 30ct Natural Northern Cross Linen or fabric of your choice with a stitch count of 81w x 50h using 2 Crescent Colours and DMC with DMC alternatives. 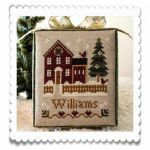 My House from Hometown Holiday Series by Little House Needleworks is stitched on 30ct Natural Linen from Northern Cross or a fabric of your choice with a stitch count of 49w x 59h using 3 Crescent Colours hand-dyed fibers and DMC floss. DMC alternatives are available for the Crescent Colours. 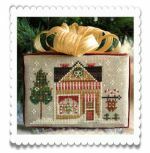 Hometown Holiday Series Sweet Shop from Little House Needleworks is stitched on 30ct Northern Cross Linen or fabric of your choice. 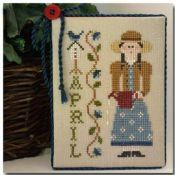 The stitch count is 60w x 42h using 3 Crescent Colours and DMC floss with DMC alternative provided. 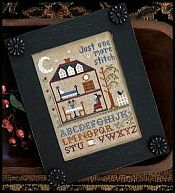 Little Sheep Virtue-Faith from Little House Needleworks is stitched on 30ct Dark Chino from R&R Reproduction or a fabric of your choice with a stitch count of 61w x 61h using DMC floss. 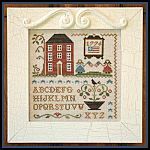 Two small white buttons from Just Another Button Company are available. 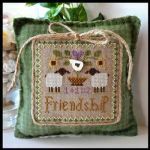 Little Sheep Virtue-Friendship is stitched on 30 count Dark Chino from R&R Reproduction with a stitch count of 61w x 61h using DMC floss. A Just Another Button Company white bird button is available. 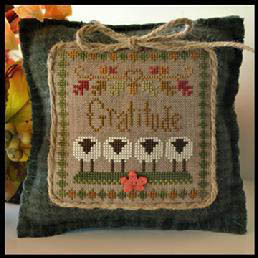 Little Sheep Virtue-Gratitude from Little House Needleworks is stitched on 30ct Dark Chino from R&R Reproduction or a fabric of your choice with a stitch count of 61w x 61h using DMC floss. A small maple leaf button from Just Another Button Company is available. 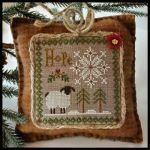 Little Sheep Virtue-Hope from Little House Needleworks is stitched on 30ct Dark Chino from R&R Reproduction or a fabric of your choice with a stitch count of 61w x 61h using DMC floss. 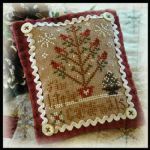 A small poinsettia button from Just Another Button Company is available. 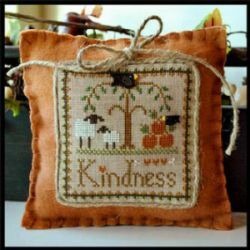 Little Sheep Virtues-Kindness from Little House Needleworks is stitched on 30ct hand-dyed Cocoa from Weeks Dye Works or a fabric of your choice with a stitch count of 61w x 61h using DMC floss. 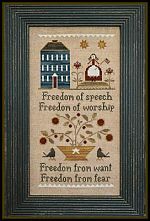 Two buttons are available from Just Another Buttons Company. 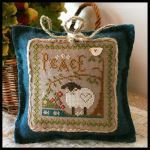 Little Sheep Virtue-Peace from Little House Needleworks is stitched on 30ct Dark Chino from R & R Reproductions or fabric of your choice with a stitch count of 61w x 61h using DMC floss. 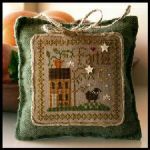 A sweet heart bird from Just Another Button Co. is included. 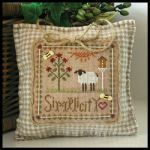 Little Sheep Virtue #6-Simplicity from Little House Needleworks is stitched on 30ct Cocoa linen from Weeks Dye Works or fabric of your choice using DMC floss. 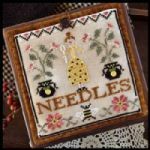 2 country bee buttons are included. 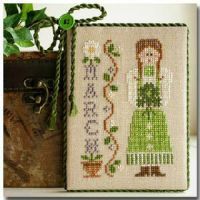 Needle Lady Pocket from Little House Needleworks is stitched on 20 count Cork Cream Linen of a fabric of your choice with a stitch count of 71 w x 71h using Classic Colorworks Perle Cotton with DMC alternatives. 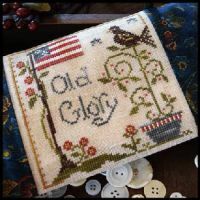 Old Glory from Little House Needleworks is stitched on 16/32 count Lambswool with a stitch count of 69w x 69h using 1 Weeks Dye Works, 1 Sampler thread and 4 Classic Colorworks with DMC alternative. 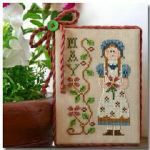 Peppermint Twist from Little House Needleworks is stitched on 30 count natural with a stitch count of 50w x 50h using 1 Weeks Dye Works, 1 Crescent Colour and DMC or Anchor floss. 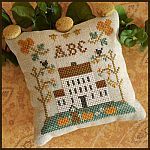 Pumpkin Hollow Farm from Little House Needleworks is stitched on 16ct or 32ct Light Mocha with a stitch count of 81w x 158h using 6 Crescent Colours, 2 Weeks Dye Works and 2 Sampler Floss with DMC conversion available. 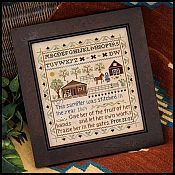 Robin's Song from Little House Needleworks is stitched on 16/32 count Summer Khaki with a stitch count of 189w x 93h using 2 Gentle Art Sampler fibers, 7 Classic Colorworks hand-dyed fibers and DMC alternatives. 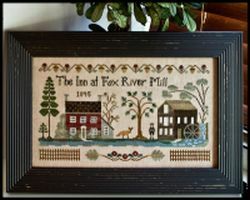 The Inn at Fox River from Little House Needleworks is stitched on 30 count Cocoa from Weeks Dye Works with a stitch count of 195w x 108h using Crescent Colours, Sampler Threads, Weeks Dye Works and DMC floss with DMC alternatives provided for the hand-dyed fibers.